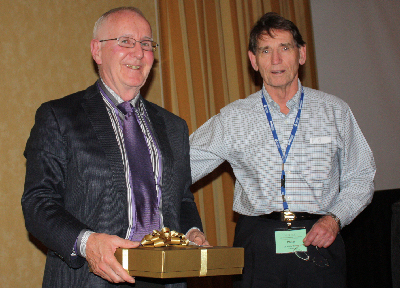 L-R: Dr. Ciaran Kealy is awarded by Past OMA Section Chair/Past OAGS President Dr. Philip Barron with a gift of appreciation recognizing him as the founder of the OAGS during the 15th Anniversary Annual Meeting, November 7, 2009. The Ontario Association of General Surgeons (OAGS) is a non-profit organization that represents general surgeons throughout the province of Ontario. It was originally created in May of 1995 out of the necessity for an independent organization to represent and articulate the concerns of General Surgeons within the structure of the Ontario Medical Association. The OMA Section Chair at that time, Dr. Ciaran Kealy of Sudbury, and his executive spearheaded this splinter group with the important objective of the O.A.G.S. to be that of liaison with other groups and cutting specialties that will affect the practice and fee relativity of General Surgery in the province. We continue to anticipate the renewed support of almost 300 General Surgeons this year - holding a status of either Active, Associate, Inactive (no longer billing OHIP), or Resident. Concerns and suggestions of both members and non-members are put forth to our 14 member board - all of whom are General Surgeons from across the province and volunteer their time and effort to our cause. Our organization continues to seek the support of all general surgeons in the province of Ontario. The O.A.G.S. feels it has been contributing a service to general surgeons since its inception. Of particular interest, the association played an integral role in lobbying for call remuneration for Ontario's surgical sections at the turn of the 21st century. Participation in such important endeavours has facilitated our success in achieving an elevated profile amongst other organizations within the province.